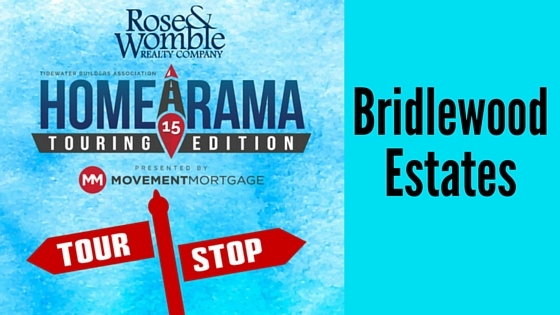 The next #RWNewHomes 2015 Tidewater Builders Association’s Homearama Touring Edition stop is Bridlewood Estates in Suffolk, Virginia. Widener Corporation is submitting two homes in Homearama, The Citation and The Secretariat. First floor master bedroom, with sunroom off of the kitchen and large media room. Shaker cabinets, crown moulding, and granite counter tops. Hardwood flooring in main living areas and tile floors in utility room and all baths. First floor master bedroom, with finished room over the garage. Kitchen has glazed raised panel cabinets, crown moulding, quartz tops, and oversized island. Hardwood flooring in the main living areas, and a hardwood staircase with stained treads and painted risers. As part of your Homearama ticket, come enjoy Reverend Jim’s BBQ and listen to the music of Cody Austin Band at The Secretariat Model.